LASTS ALL YEAR. GUARANTEED! 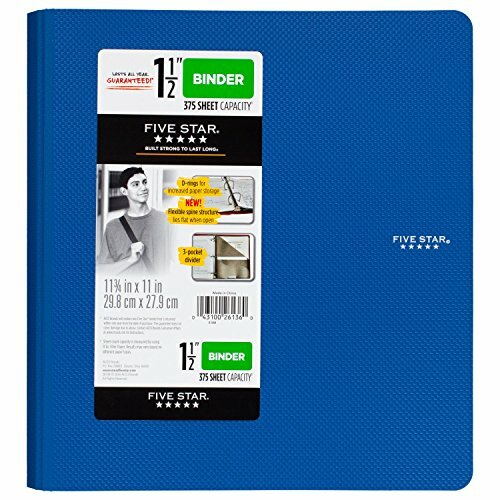 The Five Star 1-1/2" Plastic Binder’s durable, one-piece construction easily withstands frequent use. Its textured plastic cover is easy to grip and helps protect pages from damage. The binder’s 1-1/2" size holds up to 375 sheets-perfect for keeping handouts, notes and loose-leaf paper all organized in one place. Three D-rings allow for increased paper storage and keep 3-hole punched papers securely in place. The binder’s flexible spine structure lays flat for easy desktop use. Includes a 3 pocket divider to keep loose papers neatly organized inside the binder cover. Cobalt Blue. 11-3/4" x 11" in size. LASTS ALL YEAR. GUARANTEED! Binder's durable, one-piece construction easily withstands frequent use. The textured, plastic covers help protect pages from damage and are easy to grip while on the go. Binder's three 1-1/2" D-rings allow for increased paper storage up to 375 sheets, keeps 3-hole punched paper securely in place. Includes flexible spine structure that easily lays flat for desktop use. Comes with a 3 pocket divider to keep loose papers neatly organized inside the binder cover. Cobalt blue. 11 ¾" x 11" in size.